Knowing it well that a large section of tea tribes are now ensnared with RSS’s ‘Hindutva’ ideology, the BJP-led government in Assam has now gone all out to ensure that the “vote-bank” does not shift back to Congress before the Lok Sabha elections. 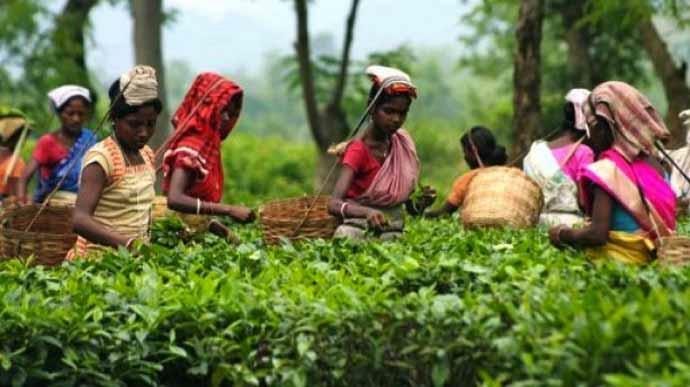 The Assam Budget for 2019-20, which was presented by Assam Finance Minister Himanta Biswa Sarma on Wednesday, proposed a number of schemes for the tea garden workers. # The Government has released Rs 99 crores to clear all the outstanding PF dues, gratuity, arrear wages, salary and bonus of 16,133 retired employees of state owned Assam Tea Company (ATC). # To provide rice free of cost to 4 lakh families in the tea garden areas covering a total of 20 lakh beneficiaries. At present, tea garden workers buy rice at Rs 3 per kg under NFSA. # To provide 2 kgs of sugar per tea garden family per month free of cost. # To provide skills training to 10,000 youth belonging to the tea tribe community. Subsequent to the skill trainings, the government will provide a onetime grant of Rs. 25,000 to this group of 10,000 youth belonging to the Tea Tribes community during the Financial Year 2019-20 for setting up small businesses. # To induct 500 girls from the tea tribes community during the year 2019-20 in Auxiliary Nurse Midwifery (ANM) and General Nursing and Midwifery (GNM) training programmes. The Government will also provide monthly stipend to these young girls. # To provide free medicines, as listed in the Essential Drugs List, to 300 tea garden hospitals. # To provide breakfast, cooked meal and evening tea and uniform to all the school students of the tea gardens.